Anticipating shots is obviously very important in table tennis as it gives you that extra millisecond to react in the best way possible to your opponent’s shot. It’s something that occupies a large portion of the way the game’s play. Another large portion is reacting to shots you did not anticipate or have little time to prepare for. There are shots that you feel lucky to just get a paddle on and even luckier to put the return in play. However, with a just a few tweaks to your game you can do much more with those shots. Is It Legal Return If The Ball Touches Our Playing Hand? How Is The Umpire Supposed To Be Sure It is Deliberate? First of all, keep in mind the harder your opponent hits it at you, the harder you can return it, with less effort. Just like in baseball, if you get a hard fastball down the middle, it’s harder to catch up with but it takes less of a swing to knock it out of the park. In baseball when you know a heater is coming, you choke up on the bat. Well, you can’t choke up on the paddle in table tennis, and you don’t have those seconds to predict what is coming at you. The key is in your grip, the angle of your paddle, and the swing. Actually, the lack of swing is a better way to put it. If you get a shot you have little time to react to, the best response is more of a punch or a flick than a swing. Also, the tendency is to back up when a hard hit is coming. If you catch the ball on the rise and angle your paddle in such a way so you can punch it back, it greatly reduces your prep time and often produces a solid return. Adding just enough wrist flick into it will give it the necessary spin to fall into the court. This shot can really catch your opponent off guard and can also keep you in the game against a flame thrower. The flick is an important and advantageous skill to master. It can help give you a jump on your opponent’s short serve and when used correctly can even score you a few quick points. Mixing it with the chop and push can give you a great variety in your returns. Both are like mini topspins but are trickier than they sound because of the limited backswing. Set in your ready position, when the ball comes short to your forehand side, slide your closest foot to the ball forward up close to the table. Extend your arm out to reach the ball and then bring your forearm up, spinning the ball forward keeping your wrist fairly stiff. Used with less or more spin and combined sometimes with a simple push over the net can give your opponent great difficulty in returning the ball, leaving you to control the game and attack. In the ready position, when the ball comes to your backhand side, slide the closest foot to the ball (depending on whether the ball is hit far- backside or in the middle, use both feet to slide up) forward and extend your arm out to the ball. U pon contact with the ball, lift your arm upwards to spin the ball. The wrist is a little looser on the backhand. When more advanced, adding in a flick of the wrist can help out with spin and is tricky for your opponent to read. But mastering it first without the wrist flick will give you better accuracy and stability to increase your skill. Same goes with the forehand flick. Because of the position he’s in with respect to the ball, near the middle of his body, he uses the same foot as his forehand flick to move forward. But the other foot should be used on far backhand shots. Many players aim towards the playing elbow of their opponent. The reason they do so is to create confusion whether the opponent should play with their forehand or backhand. So how can you return these shots? Good footwork is the beginning of the answer to this question. Footwork allows you to move efficiently and get into your ideal position for the shot. Since it makes no sense to give your opponent a chance to lodge the ball down your throat, having good footwork is the first step to master. Another good rule to follow when faced with a ball played down the middle is to use your forehand. A few players can consistently return the shot with their backhand, but the majority can’t. However, there are variables. 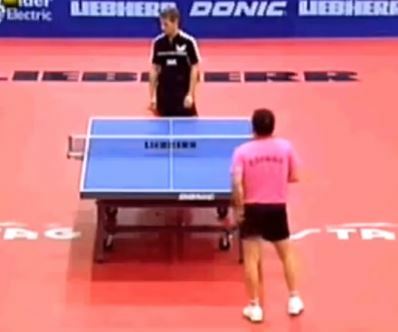 For instance, if you’re close to the table and your opponent strikes the ball, then play the backhand. This also works when the ball is moving at a high rate of speed. I would suggest pushing the ball back over the net close to the net. If you find yourself a little back from the table, then I would suggest playing the ball with your forehand. Whatever the case when the ball is hit to your playing elbow (indecision point) you must decide and COMMIT to it. If you hesitate, then your return will be rushed and cramped, most likely resulting in a lost point. Well, it also depends a lot on where your position actually is relative to the table. If you have been pushed far onto your backhand side (far-left for right handlers) then you should be tactical and use a good forehand smash down the line to give yourself a good chance to maneuver and find a position back on the table and level out your playing field. If you are far on your forehand and its getting played into your body (indecision point) down the line is harder to play but you could use a backhand chop try to drop the ball short adding as much side spin as possible. When out of position and firing at the indecision point you need to take the advantage if you can. Many people are wondering if it is whether legal or not for a return if the ball touches our playing hand? Well, the answer is yes, it is legal. It will only be considered illegal only if the racket is still in your hand. To be more precise, you can hit everything up to the wrist of your playing hand. Thus, it is legal as long as there is a single movement. 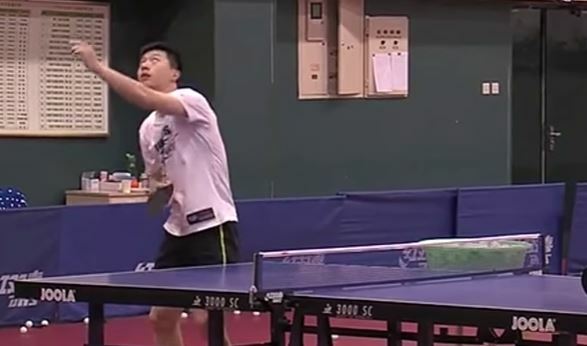 It is okay in the rule of table tennis or a player to hit the ball up to the wrist of your playing hand but as mentioned above, only if your bat is still in your hand. The new rule that being introduced by ITTF claiming that the ball can touch both your hand and the racket and that’s legal too! The is a good new rule for someone but can be bad for some other players. However, as long as you stick to the rule by not making any mistake, it should not give you a big impact when you are playing in a tournament. It is the umpire’s decision, that’s why they sit in the chair. If the umpire thinks you have deliberately struck the ball twice, he/she will award the point to your opponent. If you hit the ball twice during one smooth stroke, odds are you didn’t do it on purpose. An umpire will not give the point to your opponent. If however, your stroke wasn’t all that smooth (eg you first the ball up, after which you smash), the point will go to your opponent. At least, that’s what the umpires in my region told me. After all, there is no ironclad rule but the general practice (and recommendation to umpires) is that if the double-hit (or triple-hit) was performed as one stroke (in one motion) then it is not deliberate, and therefore legal. The rule was changed in 2008 but surprisingly enough a lot of advanced club players are still not aware of it. Nice tips you have here. I remember when I first played table tennis, I have a hard time practicing on the backhand flick, during that time that’s my weakness. But through continuous practice, I conquered that weakness.